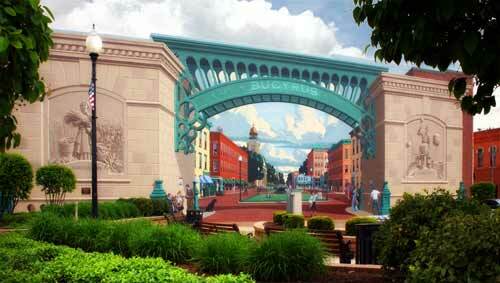 Self proclaimed as the Bratwurst Capital of America, Bucyrus is a classic American hometown. 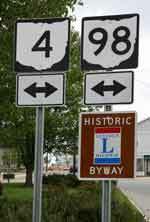 Bucyrus is located along two major historic transportation routes in Ohio's development, the Lincoln Highway and Sandusky River. Long before early settlers arrived after the War of 1812, the area was home to various Native American tribes including the Wyandot and Delaware. Today, Bucyrus is the county seat for Crawford County and home to the world famous Bratwurst Festival that was an outgrowth of the large German population during the town's early development. Early on Bucyrus was a manufacturing and railroad center. Visit D. Picking Company, the last hand-hammered copper kettle maker in America View the renowned artist Eric Grohe's two murals, "American Crossroads " & "The Light Mural." Our wurst is the best!! Order a "brat", get it with kraut, mustard and onion on a rye bun and we won't be able to tell you apart from a native. Grab a few pounds to take home with you, or order it online from our two fantastic bratwurst manufacturers. 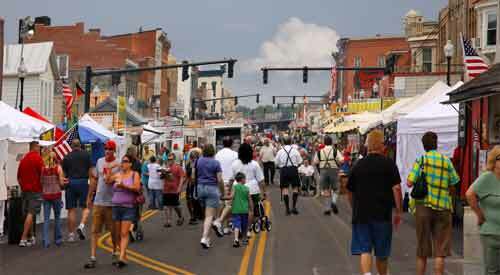 Bucyrus has a number of festivals throughout the year, but they are best known for their annual Bratwurst Festival. 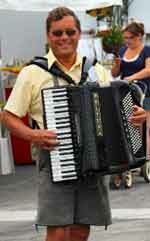 The festival celebrates Bucyrus' German heritage with more than just bratwurst. It has more than 100 delicious foods made from local family recipes that have been handed down from generation to generation dating back to "the old country." The 3 day festival is held during the third week in August. Some considered the state of Wisconsin as the authority on the bratwurst with annual celebrations held in Sheboygan and Johnsonville. However, it has been reported that in the early 1970s, Bucyrus took on Sheboygan in a "Battle of the Brats" and won the title of Bratwurst Capital of America. What was used as a measuring stick, is not known. But the folks in Bucyrus still make the claim as being the "Bratwurst Capital of America." Samuel (left) and Mary Norton were the first settlers in the area in 1819. They arrived with their 6 children, Mary Norton's brother (Albigence Bucklin) and his family, and their guide, Seth Holmes who had been through this area during the War of 1812. When they arrived here, most of the Native Americans who had been prominent in the area, had been forced to move onto lands further west around what is now called Upper Sandusky. They chose this spot because of the good farm land, and the beauty of the spot. Several years later, Col. James Kilbourne arrived with idea of purchasing some of Samuel Norton's farm for a new village. Kilbourne had realized the importance of the location of Norton's farm as being about halfway between Sandusky and Columbus and so the area would naturally become an important trading center. In 1822, the new village achieve legal status, but there is some discrepancy as to the actual name. Some documents show that the name was Bucyrus and others show that it was "Busiris". Kilbourne himself added to the confusion. A publication called the Gazetteer of Ohio that was issued by Kilbourne in 1825 had the name Busiris listed for the town. In 1824, when the first post office arrived it was given the name "Busiris, alias Bucyrus". However, that name was officially changed on the post office's records in 1829 to just Bucyrus. The name Bucyrus has been the subject of some research but nothing has been uncovered yet that definitively tells the original source for the name. It is possible that both are correct. At this time in our state's development, education was mostly up to the individual. In reading early diaries we often see misspelled words and words spelled as they are pronounced instead of their correct or formal spelling. According to ancestors of the Samuel Norton's, the name Bucyrus came from a derivation of "Beautiful" and the Persian General "Cyrus". A friend of James Kilbourne, Franklin Adams, claimed the name was derived from an ancient Egyptian city and King named "Busiris." Because they both are pronounced exactly the same, it is extremely difficult to make a choice as to which was correct. Because the name was officially changed by the post office 1829 to Bucyrus, it must be assumed that this was the correct since all the parties involved in the early founding were still alive at this time. In 1824 the first official post office was established and in 1830 Bucyrus was named as the county seat for Crawford County when Col. Kilbourne donated a plot of land to build the new courthouse. At the same time he also donated plots for a school house and jail, plus he agreed to donate 1/3 of all the proceeds from the sale of plots towards the construction of these public buildings. When the new town was laid out, several streets were named after the 12 children of Samuel and Mary Norton and when Samuel Norton died in 1856, the local newspaper called him as the Father of Bucyrus. 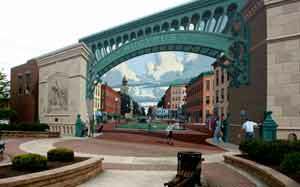 The focal point of Washington Square, Mural Park features one of two murals in downtown Bucyrus painted by internationally known muralist Eric Grohe. The murals honor Veterans and the community's contributions to industry and agriculture. One mural is known as the Great American Crossroads Mural. It is 34' high by 130' wide. The actual painting was begun on July 1, 1999 and was dedicated later that same year on October 26. Rare handmade tympani drums and copper kettles, manufactured the same way they were when the shop was founded in 1800s. The country's oldest such shop. Tours available. Jams, jellies and other country-style delicacies made on site. Tours available. Museum housing artifacts, genealogical records and historical exhibits. Part of the Ohio Historical Society Network. Crawford County was named after Colonel William Crawford who was captured, tortured and burned at the stake by Wyandotte's and other area Native Americans during the American Revolutionary War. At the time Bucyrus was settled, most of the Native Americans had been relocated to other parts of the state. In fact, when the Norton's first arrived in the area, they set up housekeeping in an abandoned Wyandot hut on the land that is now the county courthouse. That is not to say that there were no Native Americans in the area, there were, but by then they were mostly on good terms with many of the local settlers. Although they were not always welcome, the Native Americans would suddenly appear at settler's doorways wanting to trade maple sugar and berries for any fabric and tobacco the settlers might want to swap. When Samuel and Mary Norton had their first child Sophronia, the event was of great interest to the Native Americans. Many times in the days after the child's birth they would come to the cabin wanting to buy the little girl. In some diaries kept by early local residents of Bucyrus, recount tales of being frightened by Native Americans in the woods who took delight in frightening the children.